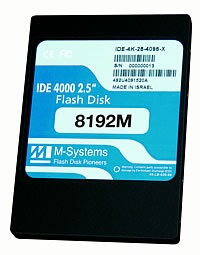 M-Systems provides innovative rugged electronic solid state disks based on flash memory. 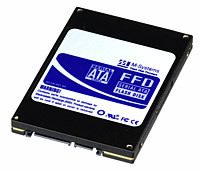 The Fast Flash Disk (FFDâ„¢) product family is drop-in replacements for mechanical Serial ATA, Ultra ATA/IDE, Narrow and Wide Ultra320 SCSI flash drives, available in standard 1.8", 2.5" and 3.5" form factors with capacities ranging from 128MB to 352GB, burst performance up to 320MB/s and read/write performance up to 45MB/s. 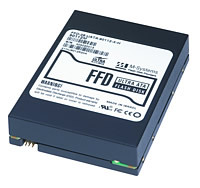 The FFD's outstanding performance is based on M-Systems' state-of-the-art TrueFFS® technology that provides true disk emulation, high read and write transfer rates, enhanced endurance and maximum data integrity under power cycling conditions. 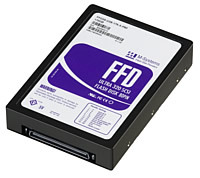 Designed for systems that require top reliable data storage operating under harsh environmental conditions, FFD is the perfect storage solution for military and aerospace, tactical computers and rugged laptops, telecommunications, blade servers and computing systems. M-Systems' FFDs have been integrated by designers since 1997 as a storage solution for data recorders, moving maps, sonar, radar, fire control systems, black boxes, C4ISR, airborne reconnaissance systems, rugged laptops, tactical computers, routers and gateways, blade servers, workstations and servers in air forces, navies and armies worldwide. Among M-Systems FFDs customers are: AirShow, Aselsan, Astronautics, Boeing, Bombardier, Cisco Systems, Daewoo, DSO, DSTA, ECI Telecom, Elbit, Elta, Ericsson, FLIR Systems, GE, General Dynamics, Harris, Hitachi, IAI-Israel Aircraft Industries, IBM, Kontron, L-3, LG, Lockheed Martin, Matsushita, Melco, Miltope, Motorola, NEC, Nortel Networks, Northrop Grumman, OKI, Rafael, Raytheon, RUAG Aerospace, SaabTech, Siemens, Smiths Aerospace, Sonus networks, SES, Staubli, Tadiran Telecom, Targa, Thales Computers & Toshiba.